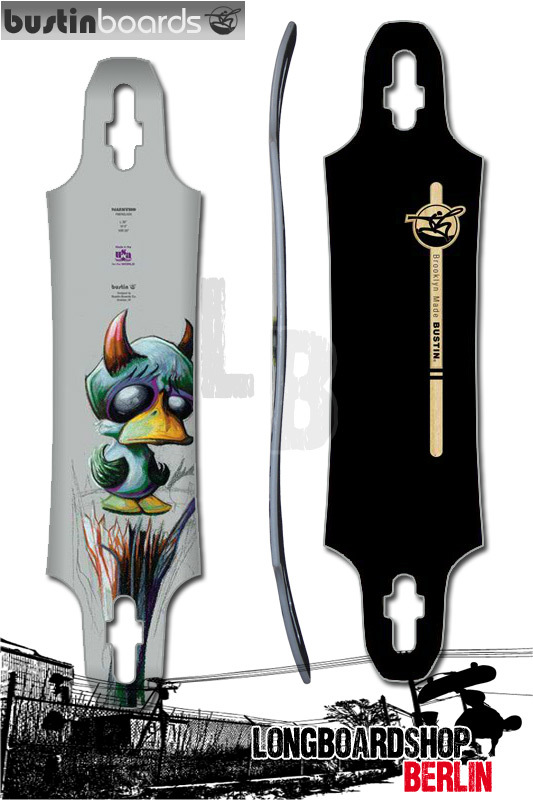 The Maestro deck is the best selling board in Bustin Boards history and for good reason. Our first twin tip shape and most flexible board ever, this 38" rig rides unlike anything that has come out of the Bustin labs to date. A hint of forward positioned camber and concave creates springy rebound in the push position while the slightly recessed rear pocket holds your foot and allows for easy transitions from kick to board. A usable, kicked nose and tail allow for a range of creative freeride potential and the super wide foot positions make for a comfortable, predictable stance. If you want a deck that reminds you of your snowboard, this is your board. This season we’ve refined our production and expanded our offerings to make sure you get the right Maestro for your size and style. This board is designed to be an ultra fun, freeride longboard. What does that mean? It means that its a 3 pound, 38 inch magic carpet that only you can learn how to fly. This longboard is straight fun for everything from casual longboarding sessions around town with your friends, to focused trick training, to high speed rural hill bombing and hard carving. Its the kind of board you just can't get off no matter what you have to do or where you need to be. Be warned, longboarding addiction may follow. The Maestro is designed to work with most longboard trucks. The drop thru-mounts are specifically engineered to fit Bear, Randal, Gullwing, Paris, Caliber and Tracker trucks. The board was designed to work best with 180mm reverse-pin longboard trucks such as the Bear Grizzly, Randal RII and Paris 180, but for a lower, looser ride can be used with Gullwing Mission 1. This board is designed to be wheelbite free with most truck/wheel combos, but we suggest not going larger than a 75mm wheel. Also, if you are running Randal RII's we suggest sticking to a 70mm or smaller wheel because wheel bite can occur. The key to all setups is having the right components for your size, style and terrain. This spring we’re introducing new, laser-cut grip across our product line. The new grip is designed to give you the same aesthetic design while increasing traction and durability. For every version of the Maestro, that means more grip coverage where you need it and the same Bustin style you dig.